Few can have missed the main story in town over the last ten days. Ludlow’s town walls are falling down, or at least a substantial section has fallen and is under threat of falling. Fortunately we have a responsive council. Shropshire Council organised an immediate response, making safe collapsed areas and shoring up areas under threat of further collapse. Shropshire is fortunate is having heritage expert Colin Richards as its Historic Environment Manager at a time when many local authorities are making their heritage teams redundant. Hiring in consultants can be no substitute for having in-house expertise. On Friday, a risk of further collapse between the Upper Linney and College Court was identified. Local councillors, Martin and Rosanna Taylor-Smith, council leader Keith Barrow and the police worked tirelessly to ensure that residents were informed and where necessary evacuated. They are to be applauded for their efforts. As attention turns to repairing and stabilising the section of wall north of St Laurence’s Church attention turns to the costs. There is little doubt that several hundred thousands of pounds will be needed. It is unfortunate that Martin Taylor-Smith told a meeting on Thursday that the costs can be met from council reserves. There is no doubt that there will be a call on the reserves, but the principal costs are likely to fall to the Diocese of Hereford, the town council, heritage bodies, insurers and possibly even householders. The financial position is far more complex than Martin suggested and this will inevitably delay repair. It isn’t the case that old walls fall down. Its neglected old walls that fall down. This is one of the most serious examples of damage to an ancient monument in decades. Although a lot of investment has been made in the walls, it clearly has not been sufficient. The sterling efforts of the Town Walls Trust clearly need backing up with more resources and funding. Colin Richards told Thursday’s meeting that English Heritage are considering a full survey of the walls – which are some of the most complete in Europe. This is long overdue. Only when we know the full extent of problems can bodies like the town council and the Ludlow Town Walls Trust plan to raise the resources needed. 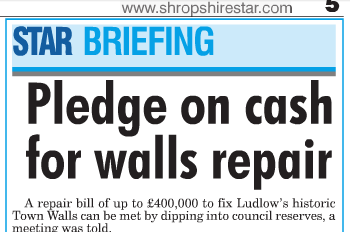 The final bill for repairing and stabilising Ludlow’s town walls may be astronomical. But it is a bill that will have to be met.